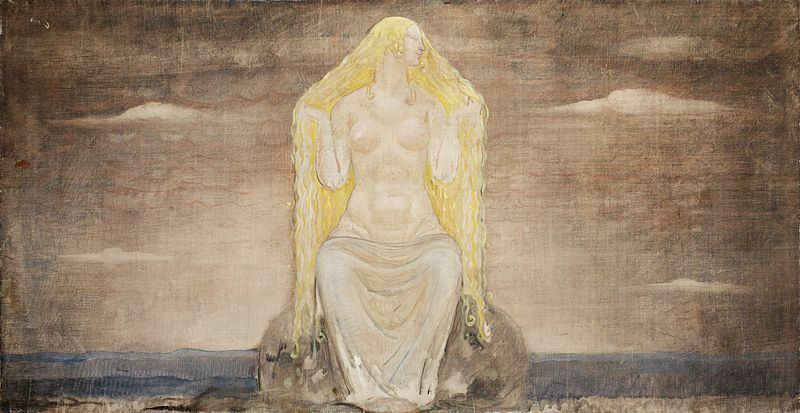 Freya was also known as Freyja or Frea; her name means “lady”. She was the daughter of Njord, a sea god, and twin sister of Freyr. They were not Aesir but Vanir, one of the two classes of Norse gods. After a war between the Vanir and the Aesir,the two sides agreed to peace, and Freya went with her father and brother to live in Asgard as a token of friendship and good will. 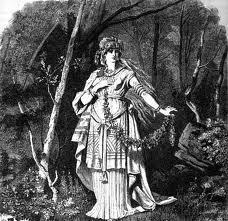 She was sometimes confused or equated with Frigg, Odin’s wife. In Asgard, she lived in a hall called Sessrumnir and drove a chariot drawn by cats, symbols of her independent nature. She was a goddess of love, lust, fertility, and magic. She was married to a god called Od or Odur, and bore two daughters, Nossa and Gersimi. Od disappeared mysteriously, and there are many mentions of Freya looking for her husband in various guises, crying tears of gold for him. Her association with gold was such that “Freya’s tears” became a poetic way to refer to gold. As the goddess of love and lust, Freya was quite free with her affections, and her beauty meant that she never lacked suitors. One of these was a human man called Ottar, who was said to be a distant descendant of the hero Sigurd. He was a warrior leader who caught Freya’s eye through grand sacrifices- he turned his stone altar to glass through the heat of the fire that he used to prepare his offerings. Pleased and impressed by his devotion, Freya helped Ottar find the information about his ancestry that he needed in order to claim his inheritance. In the process, she turned him into a boar and even used him as a mount, and using both threats and flattery, she managed to pry the needed information from the giant who held it. Freya’s greatest treasure was the Brisingamen, a beautiful necklace made by four dwarves. When she first saw it, she immediately wanted it. As payment, the dwarves demanded that she spend a night with each of them. Though she was disgusted,she wanted the necklace so much that she agreed. Later, Loki found out and told Odin about Freya’s behaviour. Odin was annoyed by Freya’s prostitution, and he had Loki steal the necklace from Freya. In one version of this tale, Heimdall saw the theft and chased after Loki, recovering the necklace for Freya. 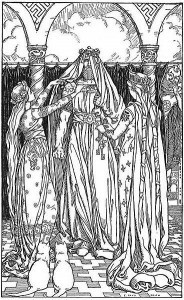 In another version, Freya went to Odin and begged him to give the Brisingamen back, and he eventually did so, but only under the condition that she sow discord between men and cause wars. Freya’s wantonness did not apparently sit well with Loki, who accused her of sleeping with every god in Asgard and every elfin Alfheim, but when she was in danger, he usually found a way to help her. When the giant Hrimthurs, in the guise of a man, claimed that he could build a solid ice wall around Asgard in a single winter, in return for the sun, the moon, and Freya’s hand in marriage, Loki persuaded the gods to accept the deal, saying there was no way he could complete the wall in time.However, with the help of his horse Svadilfari, Hrimthurs made good time, and it looked like Freya would have to marry him.Loki disguised himself as a mare to distract Svadilfari and the wall was left incomplete. Hrimthurs became angry at losing the wager, and revealed himself to be a giant, whereupon he was promptly killed by Thor. 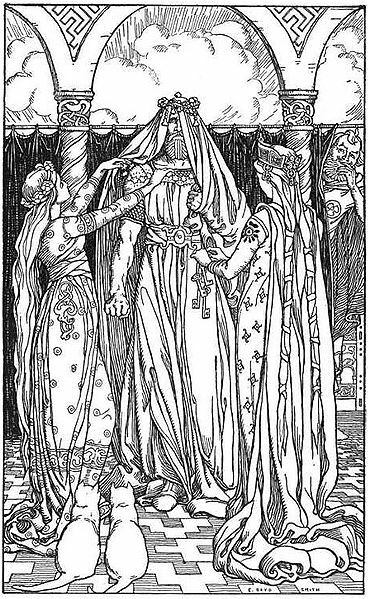 Loki and Thor saved Freya from marriage to a giant a second time when the giant Thrym stole Thor’s hammer Mjolnir and demanded Freya as his wife, in return for giving the hammer back. At the thought, Freya became so angry that the gods quickly sought another solution. Loki and Heimdall devised a plan whereby Thor dressed up as Freya instead. With Loki as his clever bridesmaid, Thor was able to deceive Thrym, recover Mjolnir, and kill the giant. Unlike her equals in other pantheons (Aphrodite in Greek and Venus in Roman mythology), Freya was also a goddess of war,with a love for combat and a fierce temper. After a battle, she and Odin divided the slain warriors between them. As such,it was fitting that her beauty occasionally caused strife when giants or men tried to win her hand or coerce her into marriage. A powerful sorceress, Freya was able to fly using a falcon’s skin, and she is said to have taught the Aesir the magic of the Vanir when she arrived in Asgard. In Norse society, magic, or seidr, was the domain of women, and Freya was its patron goddess. Odin practiced magic, too, but this was seen as unusual, and it was likely more due to his being the chief of the Aesir, and his thirst for any and all knowledge. Norsemen did not, as a rule, practice magic, and it was seen as unnatural and effeminate for them to do so. Women who practiced magic invoked and sacrificed to Freya. The völur, older women who traveled around the land selling their magical services to others, were in a sense Freya’s representatives in Midgard. A völva was essentially a witch, a woman who left her family behind in order to travel from town to town and perform magical rites and other services for the people there. Aristocratic women, likewise, often practiced magic and took an active role in their husbands’ campaigns by supporting it through magical means at home. Freya was an important role model and central figure for these women. Freya was one of the most popular Norse goddesses, with many place names in Scandinavia referencing her, and folk beliefs about her abounded. She was said to sprinkle dew when she flew across the land in the morning, and her presence was said to be shown by sheet lightning (distinct from the destructive thunder and lightning that signaled Thor’s rage). She was revered as a fertility goddess well into the nineteenth century.